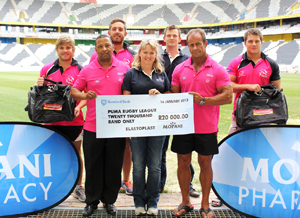 The Ford Puma’s accepted a R20 000 cheque and 50 new tog bags fro the team from Elastoplast and Mopani Pharmacy yesterday at the Mbombela Stadium. The money will assist with the strapping needs of the players for the games ahead. Mopani Pharmacy is also sponsoring the Puma’s monthly protein requirements. As a proud local pharmacy, Mopani is very excited by the Puma’s move to the Lowveld and encourage other local businesses to help them make a success of their road ahead. Puma’s players, Jimmy Stonehouse and Marius van Rensburg accept a cheque and tog bags from Elastoplast and Mopani Pharmacy. Hennie Kriek – kitted out in brand new gear – at the recent Sabie Solo Xperience. Hennie came second in the sub vet category and fourth overall. Local mountain biking ace, Hennie Kriek, ended his 2012 season with yet another podium finish at the recent Sabie Solo Xperience four day stage race (14 to 17 December). Hennie took just over nine hours to complete the total 196 kilometres, earning him a second place in the sub vet category and a fourth place overall. It was his eight time participating in this local race which he describes as well organised with world class tracks. “The weather was perfect, the scenery was stunning and there was strong competition with accomplished riders from all over South Africa taking part. All in all a great experience,” he concludes. Hennie is now gearing up for his 2013 season which will kick off on 26 January with the first leg of the MTN National Marathon Series in Barberton. Other mayor races on his calendar includes the ABSA Cape Epic (eight days, 800km) in March, the new Lowveld Quest (four days, 300km) in April and the Sani2c (three days, 230km) in May. Hennie is proudly sponsored by Mopani Pharmacy.